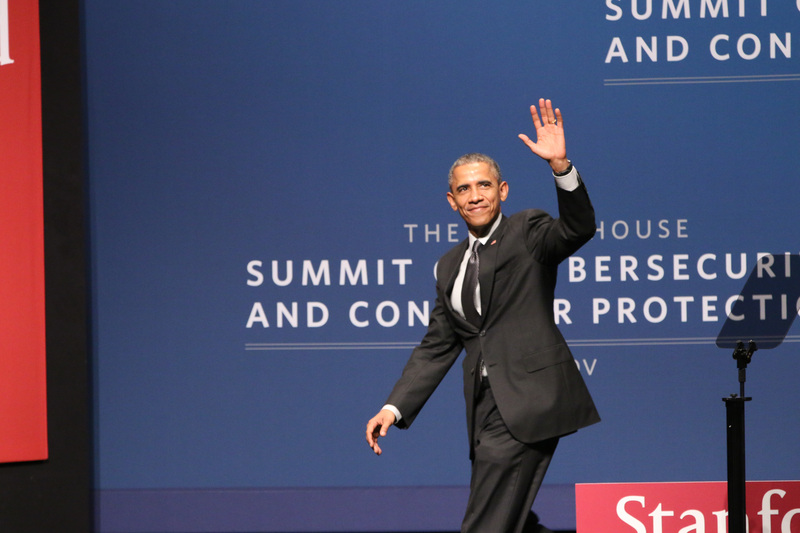 Highlighting some of the significant technological innovations that came from the University, Obama explained that the choice to host the Summit at Stanford was natural. “When we had to decide where to have this summit, the decision was easy because so much of our information age began right here at Stanford,” Obama said. “According to one study, if all the companies traced back to Stanford graduates formed their own nation, you’d be one of the largest economies in the world and have a pretty good football team as well,” he added. The President even joked about his desire to attend Stanford University. In his introduction for the President, Stanford President John Hennessy explained that Obama himself has also faced challenges with security and technology. 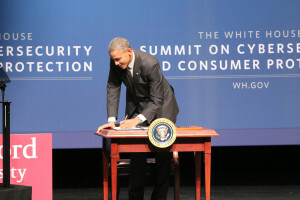 Obama outlined the basic principles for dealing with threats to cybersecurity and consumer privacy, emphasizing the importance of the government and private sectors working together to tackle the issue. In addition to sharing information “as true partners,” the sectors must focus on their unique strengths and different skillsets, the President explained. Finally, he spoke about prioritizing the protection of Americans’ privacy and civil liberties and the difficulties of respecting privacy while also ensuring national security – an issue faced by both the private and public sectors. The President presented a number of policy proposals and asked Congress to pass legislation. His administration is working toward establishing a single national standard that will ensure that Americans are notified within 30 days if their information has been stolen, and it has also proposed the Student Digital Privacy Act. Obama called for a consumer privacy bill of rights that would give Americans a baseline of protections, like the right to decide what personal data companies collect and the right to know how companies are using that information. This week, the White House also announced the creation of its Cyber Threat Intelligence Integration Center. “Just like we do with terrorist threats, we’re going to have a single entity that’s analyzing and integrating and quickly sharing intelligence about cyber threats across government so we can act on all those threats even faster,” Obama said. After his speech, the President signed an executive order that he hopes will make it easier for companies to get the classified cybersecurity information they need to protect themselves. The order calls for a common set of standards around protecting privacy and civil liberties. Obama noted the difficulties that lie ahead in dealing with cyber threats. “The cyber world is like the Wild, Wild West – and the government is asked to be the sheriff,” he said. According to Obama, America holds a leadership position in the digital economy that makes it necessary for the country to focus on cybersecurity. In addition, the fact that American companies are being targeted ultimately makes cybersecurity issues a threat to America’s economic security. Contact Andrew Vogeley and Kylie Jue at avogeley ‘at’ stanford.edu and kyliej ‘at’ stanford.edu.